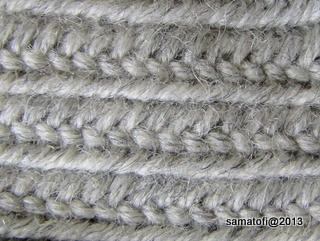 Nordland mentions in his book that there are mittens made in this stitch from Oulu (Finland; Oulu is also called Uleåborg), Överkalix (North Sweden), and Verdal (Mid-Norway). There is also a small photo of the Oulu mittens in Nordland's book. 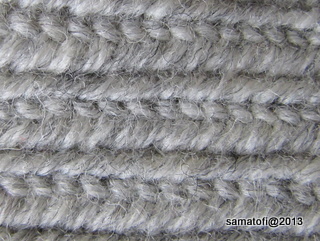 The mittens appear to be either white or pale gray, with square tops, and some minor decoration at the cuff. The same Oulu mittens seem to be viewable also on the Swedish Digitalt Museum's web site (link).